2016 Update: As of November 2015, Dominick’s has closed after 67 years. Dominick’s restaurant and bar in West Hollywood recently underwent an extensive renovation. The New York neighborhood-inspired restaurant enlarged their patio and added two roaring fireplaces to help create a more relaxed and inviting ambiance for events. The side patio can accommodate up to 35 to 40 guests and is ideal for more intimate gatherings. The side patio includes a large fireplace, two spacious couches and mini cocktail tables; making it easier for guests to mingle. For larger gatherings, the back garden patio is an ideal setting–it can seat a dinner for 85-115 guests and entertain up to 130-140 guests. Both patios feature luscious gardens, making them idyllic settings for spring and summer events. In the last year, Dominick’s has held a number of soirees. The biggest by far was Details Magazine Cover Launch. The launch included an exquisite dinner, drinks and a guest list that included a mix of celebrities including Dominick’s regular, Ryan Reynolds. 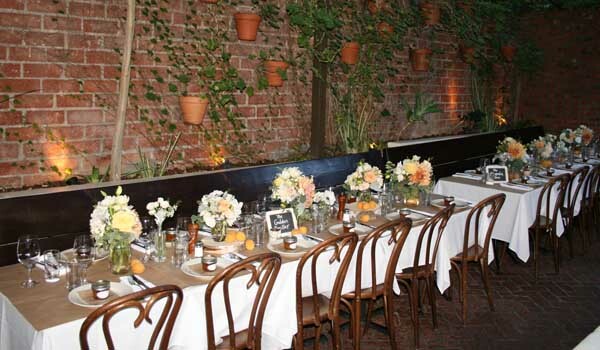 One of the more unique events that the restaurant held was a stunning moss, wood and apricot themed wedding. The restaurant underwent a remarkable transformation for the event, which left owners Warner Ebbink and Brandon Boudet speechless. Owners Ebbink and Boudet pride themselves on the number of variety of parties that they have held in the last year. They believe that each person’s event, party or celebration is really their own, and that they are there to help bring their vision to life inside of Dominick’s.